Nate Derstine ‘10 biology graduate, conducted research during two and a half years of college with Dr. Roman Miller, professor of biology. His goal was to determine the effects of Genestein – a phytoestrogen compound found in soy – on male reproductive development in mice. Derstine’s studies confirmed the hypothesis that phytoestrogens have detrimental effects on sperm production and maturation. He discovered decreased numbers of mature spermatozoa, and increased numbers of immature sperm cells. “Further research needs to be conducted to determine the relevance of these findings for humans,” he notes. 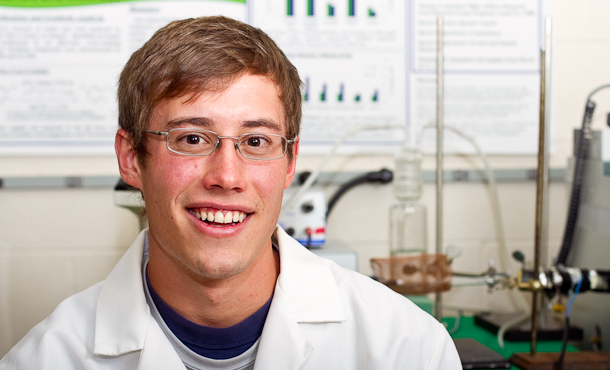 Currently Nate continues to work for EMU associate professor of chemistry, Dr. Matthew Siderhurst. Siderhurst received a grant for research related to fruit-piercing moths at The Pacific Basin Agricultural Research Center in Hawaii. “My relationships with both Dr. Miller and Dr. Siderhurst have been beneficial,” reflects Derstine.